Cameron Boxer has built a lifestyle around playing video games. He’s got a sweet setup in the basement, flies completely under the radar at school, and his biggest problem is deciding which of his friends, Chuck or Pavel, would be the best partner for a huge gaming competition. Life couldn’t be better, until – distracted by a game and not registering his mom’s instructions to take the ziti out of the oven in 10 minutes – he almost burns the house down. Following the smoking ziti incident, 13-year-old Cam’s parents insist he engage in an activity other than playing video games. But, true to the title of Gordon Korman’s latest novel, Cam has an idea for how to avoid doing anything that will cut into his gaming time. Cam gets Pavel to hack into the middle school’s website and create a splashy page for a new community-service club, the Positive Action Group. Cam makes himself president of the group, but the P.A.G. is a club in name only. At least, until do-gooder Daphne Leibowitz stumbles upon the P.A.G. page and pressures Cam to get on board with her idea to build a habitat for Elvis, a geriatric homeless beaver. It isn’t until the P.A.G. is shut down by the school and the town itself is threatened that Cam realizes there is more to life than gaming. 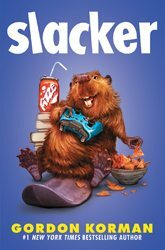 Without shoving the lessons down the reader’s throat, Slacker does a great job teaching kids about the value and fulfillment of helping others, and the perils of being intensely focused on one single thing to the exclusion of all else. While the ending feels a bit too tidy, readers will be able to see themselves in the well-drawn characters that populate this quirky, funny, and relatable book.